2012 was a year where I began covering some broader areas. While I continue to follow services that do social aggregation as well as services that leverage social data, I continue to focus quite a bit more on personal data as well. I’ve been following sensing devices that focus on gathering data to help improve our lives. I also continue to research ways that we can protect and archive our data for the future. The year started out in a way that caused my professional and personal lives to collide. 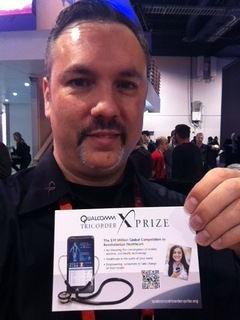 I went to CES to help my employer, the X PRIZE Foundation, launch the Qualcomm Tricorder X PRIZE. This new prize aims to bring healthcare to the palm of our hands. The competition aims to provide devices that will have multiple sensors that collect data to be analyzed so they can provide the ability to diagnose a set of diseases. While at CES I spent time looking at many of the health and fitness gadget announcements and wrote a round-up of them as well. It’s a very safe prediction to say that 2013 will be a year were sensing devices will continue to gain momentum. The devices and associated apps and services will continue to become better at providing simple and clear value to people. Many of these devices are starting to leverage gamification and social motivation features that are making them compelling for people to get results. And it’s the results which is what it will take to push them more into the mainstream. At this year’s SXSW I attended a panel that had a strong impact on me on the topic of preserving life beyond death. I’ve always pondered about how our digital data will prosper after we die and this talk covered many aspects of that undeniable reality. When I got back I wrote a lengthy post that summarized the panel and added my thoughts. It eventually prompted me to create a dedicated section on this site to provide resources for people so they can prepare for digital preservation. I continue to monitor many aspects of this area and I recently wrote a post for The Next Web on the emergence of smart journals which I believe will become increasingly more important as people realize the value of owning and archiving their personal data as opposed to treating it as throwaway content for social services. You can see that digital preservation was part of the reason I started looking at smart journals and that was a continuation of my thoughts on why owning our own data is important. I’ve been disappointed by the fact that the Locker Project seems to be in indefinite hiatus. The hopes for an open and federated personal data service that can flourish is why I decided to back app.net. We need a service that will put users, their data, and privacy as their main priority. There are many challenges for a service to be successful with this strategy but I’m hoping we will see one come along soon. An area that continues to see progress are services that revolve around leveraging social data aggregation. The break out category for this is social news readers which I have covered extensively. Flipboard continues to be the most popular and I’m a fan of it, however I find Zite and Prismatic to be the best ones for helping me discover interesting stories that my network may not have shared. Also Showyou and Squrl are great apps that take a similar approach by leveraging social data aggregation specifically for videos. I covered several new services this year which stood out for me. Placeme is an app that passively tracks locations you visit. Passive tracking of data beyond location seems like a ripe area for innovation if privacy concerns don’t scare off people. A very cool new service for Lifestreaming called Rebelmouse launched this year which offers a great design along with some great editing and filtering of social data it imports. They have also been continually improving the service aggressively since they launched. Vizify created a new way to visualize Lifestreaming data with the release of their service which generates beautiful interactive infographics. I also just recently discovered Alternion which so far has really impressed me. If you haven’t yet heard of Singly, I’m pretty sure you will in 2013. They provide a service which can be used to provide social logins, social data importing and aggregation, along with powerful formatting, de-duping, and normalization of that data. Many new and innovative services can be created by not having to develop all of these features and letting Singly do this heavy lifting for them. 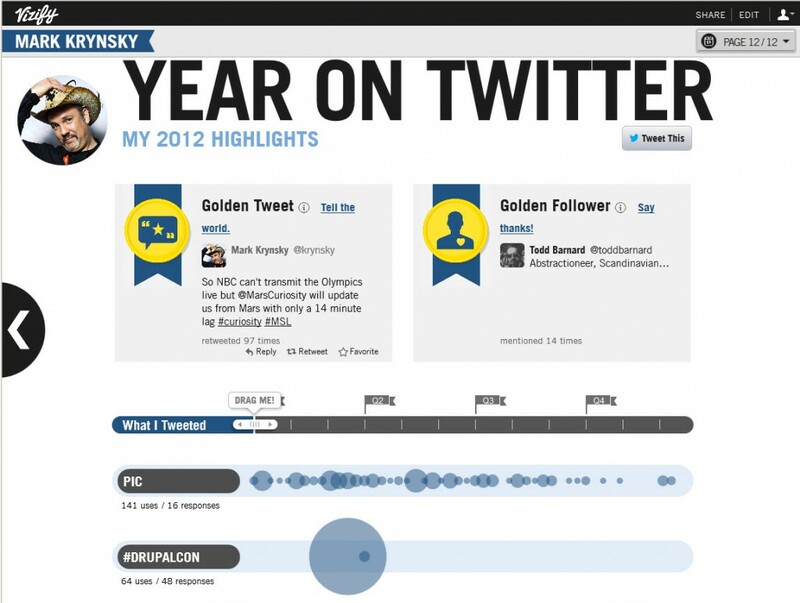 I covered Showw.me this year which is a Lifestreaming app built on Singly and Timehop is a favorite app of mine for traveling back in time with my social data which uses Singly as well. I’m sure we’ll continue to see many more great services utilize them in 2013. Happy new year and thanks to all of you who read this blog. I look forward to continuing to bring you coverage in these areas in 2013. Mark, this post was great. So inspiring to see all these developments unfolding! Keep up the great work; hope life’s treating you well! Thanks Marshall. I really appreciate the feedback. Life is going great as well. I’ve been keeping up with the developments over at LIttle Bird which seems to be progressing nicely. Best of luck in 2013!